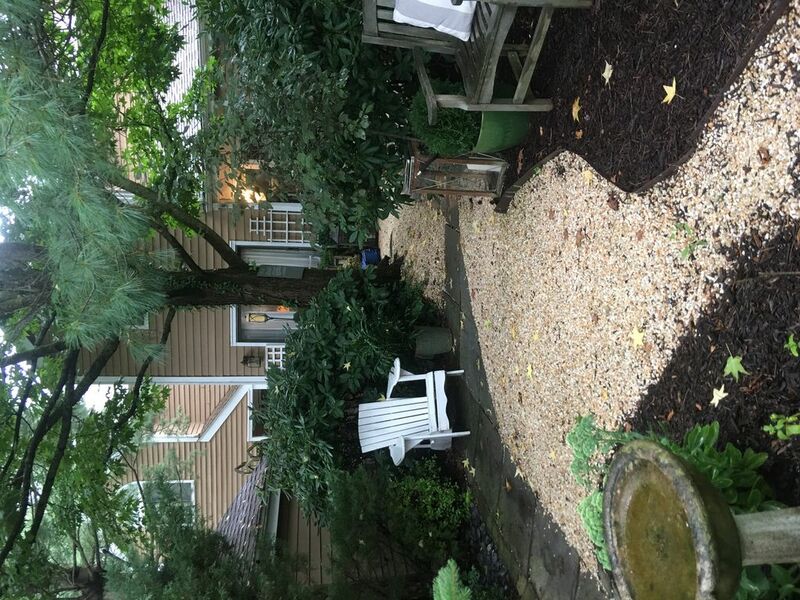 All inclusive Designer Townhouse /Cottage located in Chappaqua NY, 35 minutes to midtown Manhattan via NY Metro North Trains. Wonderful opportunity to vacation in NY without hustle bustle and large expense. Enjoy 2300 SF convertible 3BR, w/ 3.5 full baths, formal dining room, sunken living room, library and family room. WPPLC. Quality Designer furnishings throughout. Views of lovely pond from most rooms. Large EIK modern kitchen with all conveniences. Sliding doors to beautiful lush front and rear garden. Dine and cook outdoors. Enjoy evening fires in fire pit. Two large comfortable beds, both queen. Armani leather couch downstairs in LL can also be used as comfortable bed. The Town of Chappaqua ( 3 minute from the house, or ten minute walk) is a urbane, sophisticated yet laid back total friendly, safe family town. Easy access to all shopping , wine shops, eateries, etc. Our private development includes swimming pool, tennis courts, basketball court and nice playground for use. Owners will consider the use of our Mercedes Benz SUV. Inquire today. Friendly suburban professional couple seeks AAA renters during the period described to rent our home. We offer our lovely home and all of its conveniences to you so that you and your Family may comfortably enjoy your holiday saty. This is a comfortable large alternative to a hotel or small Manhattan Apt. It is a pleasant clean safe and upscale family friendly town located a mere 40 minutes by train or car to midtown Manhattan. It is located within a lovely development that is situated on a wildlife sanctuary. Watch as the Egrets perch themselves on Nearby tree branch on our pond for feeding. Listen to the owls at night. Enjoy an evening fire in the fire pit or indoors weather permitting. Dine alfresco in my garden.